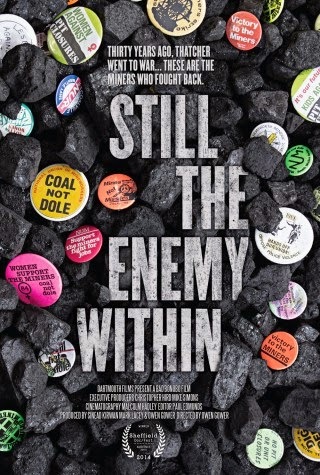 STILL THE ENEMY WITHIN is a British documentary that comes to us much-lauded - it won the Audience Award at Sheffield Doc Fest and has received starry praise from Britain's foremost investigative journalist John Pilger. To be sure, it covers a topic of burning importance, although I fear much of today's youth do not realise it's importance in shaping modern Britain - the 1984 Miner's Strike. To give context to this in the current age when Britain's politics has cleaved so much to the centre with the big economic debates basically drawn within Thatcherite principles - the free market, enterprise, deregulation and privatisation - is difficult. Do kids realise just how polarised Britain was in the 70s and 80s? When we experienced the very limited London riots a few years ago I tried to explain to some coworkers what it felt to be a kid in the early 80s - when race riots and IRA bombings were common - when people were collecting money in the street to support the miners - when having AIDS was seen as a kind of biblical judgment and gays were pilloried - when Prime Ministers Question Time was offering the country a choice between radical free market economics and proper Socialism. Do kids these days realise that Britain in the late 70s was Greece today? Bankrupt, the IMF called in, power outages? Do they realise that for every free market triumph of Thatcher, whole sets of industrial workers were consigned to the long-term unemployed - men out of time? The point is not which side of the political divide you fall on - this blog used to be called Movie Reviews for Greedy Capitalist Bastards and I am a beneficiary of the reforms that occurred in that decade. But no-one, not the most ardent opponent of the power of the unions rejoices in the idea of picket lines being destroyed by militarised police beating people up; or miner's children combing slag heaps looking for fuel in a cruel winter. The debate needed to happen - was Britain going to structurally reform or remain broken? But the means by which the unions were broken was savage, pre-meditated and their were ample dirty tricks on each side. All of which is long pre-amble to my review of STILL THE ENEMY WITHIN - a meticulous and patient retelling of the strike from men and women who were on the picket lines from the start to the end. Their voices are clear, articulate and charismatic and one cant't help to feel for them. Because ultimately the strike was doomed from the start. Why? Because it wasn't national. Because while Yorkshire and Wales and Scotland walked out, Nottingham didn't - Nottingham was promised it would be exempt from pit closures and didn't. And then, when it came to the Trades Union Congress, no other set of industrial workers supported the miners. Not the dockers, not the railwaymen, not the steelworkers. No-one. The miners were left hanging. They were hanging from the start. And the only thing I hold against the NUM leadership is that they let the pain go on so long, when the workers were without pay, marriages crumbled and kids lived without food and fuel. The tragedy of this documentary is the hopefulness of the participants - the lack of acknowledgement that they lost. That today New Labour has more in common with Thatcher than Scargill and that union power has effectively dismantled. And because that strike was so pivotal, I wanted more. I wanted interviews with the leaders and miners in Nottingham explaining why they didn't back Yorkshire. I wanted interviews with the leaders and workers in the dockers' union explaining why they sat back. I wanted the other side of the story. Still, the documentary is worth watching - indeed it should be required watching. As I said before, those who care about how we came to this current political juncture - about civil rights - about the true human cost of any political campaign - shouldn't ignore this key battle. STILL THE ENEMY WITHIN will be released in the UK on October 3rd. The running time is 112 minutes.